Last night after we poured wine for the cast party/post A Prarie Home Companion live from DPAC event, I was beat from a long day of wine. 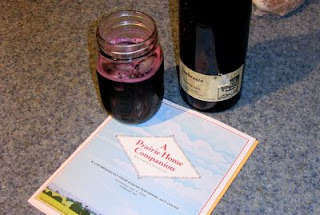 The first thing I did was pour some left over Ceci, Lambrusco from Saturday's free tasting and sit down for a glass. Now here's the reality. In a humbling manner, I look back at my youth and think of all the terrible mistakes I made of putting wine on a pedestal. I scorned if someone didn't use the proper glass, even for a $5.99 Chardonnay. Or if the wine's drinking temperature was incorrect, mercy me, how could they? Prices, big prices in fact, impressed me and I would never see why someone could enjoy an $8 Cabernet Sauvignon. Last night I drank my Lambrusco, of all wines, in a ball jar with three ice-cubes to give it a chill. And you know what? It was the best glass of wine I tasted all week. I've come full circle and encourage you to do so the same. Let's just drink wine and enjoy it without all the fuss, the snobery and pomp & circumstance. I enjoy wine more now than ever.